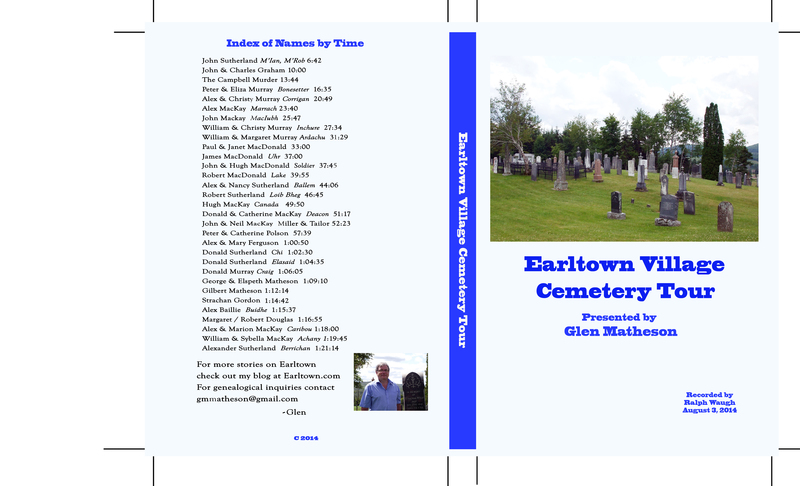 As part of the Gathering at Earltown this past summer, a tour of the Earltown Village Cemetery was presented. Thirty one families were featured in the 1 1/2 hour journey into the past. As well as some family history, there was a brief overview of the founding of Earltown and the creation of this picturesque and peaceful resting place. It was decided that video recording should be produced to capture some of the oral traditions of the area with the added purpose of raising funds for the maintenance of the cemetery. Our DVD is now ready for market. The cost is $15 CDN or $13.80 US plus shipping of $2 to a Canadian address. For US destinations, please provide your address and I will be able to provide an accurate quote. PS – Those who have already indicated an interest will be contacted by email. With mixed feelings, I am still part of the work world so time for this project is somewhat limited. There are a number of ideas on a list which I hope to address this winter.